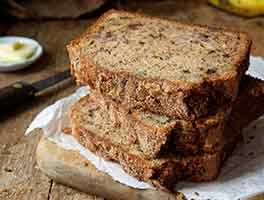 This dense, moist quick bread showcases the spicy bite of candied ginger. It's not a high-riser, so don't expect the usual dome-shaped loaf. Instead, this bread rises like a river, even all the way across, and slices into lovely thin rectangles, ideal for spreading with some candied-ginger-spiked cream cheese. We've used Bosc pears as the fruit here, but peaches, nectarines, plums, bananas, or even applesauce would be just as suitable. We haven't tried it with zucchini, which is probably ubiquitous in everyone's garden right now, but we imagine that, with a suitable increase in sugar, even that might work. 1 hrs 20 mins. to 1 hrs 25 mins. Preheat the oven to 350°F. Line with parchment, or lightly grease, an 8 1/2" x 4 1/2" loaf pan. In a large mixing bowl, cream together the sugar and butter, then add the egg, beating until smooth. Add the pear purée, flour, ground ginger, baking soda, baking powder, salt and vanilla. Beat until smooth. Stir in the candied ginger and nuts. 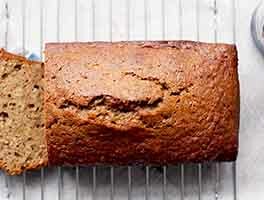 Bake in a for 55 minutes to 1 hour, or until a cake tester inserted into the center of the loaf comes out clean. Remove the pan from the oven, and cool the loaf in the pan for 15 minutes. Gently remove the loaf from the pan and cool it completely on a wire rack. Store, well-wrapped, at room temperature for 5 days, or freeze for up to 3 months. There's no need to peel the fruit; just purée it well in a blender or food processor. Hi, I have made the recipe many times. I reduce the sugar to 1/2 cup. I have tried it with apples, and most recently with excellent results, sweet potatoes! I do not add nuts since I often take baked goods to school, and so many have allergies. I made this recipe into muffins and used a gluten free flour mix (xanthum gum included with a variety of starches and rice flour). I upped the oven temperature to 375 and baked for about 15 minutes. The recipe made about 15 muffins. The flavor was great, not too much ginger or sweet. But I love ginger! My ginger was a little sticky. I minced the pecans fine, some of it turned to 'flour' and thoroughly mixed with the ginger. The extra work seemed to do the trick. The muffins had a nice texture, especially for gluten free. 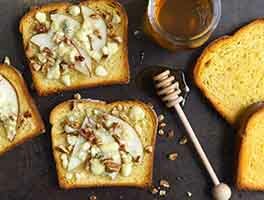 This is a wonderful recipe.I'm making it again!Also I am freezing extra pear puree for winter use.One question, I can't seem to find the recipe for the candied-ginger-spiked cream cheese spread.Can anyone help me with this? 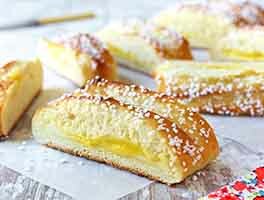 I had several mushy pears that I needed to use, so I was delighted to find this easy recipe (and even more delighted that it did not involve peeling mushy pears!). I made some slight adjustments--I used 1/2 whole wheat pastry flour in place of all AP flour; I baked the batter in 3 small loaf pans rather than 1 large one; and I added some streusel I had left over in the fridge. It was fantastic! I'd definitely make it again, and I think the small loaves would be a lovely holiday gift. Baked this yesterday and it's absolutely delicious: pureed a huge honey crisp apple and used roasted & salted mixed nuts, finely chopped. Very moist and nice texture, wonderful ginger kick. The loaf (as another reviewer mentioned) also stuck a bit on bottom of loaf pan, so next time will grease and flour, or use greased parchment, rather than just spray with Pam. This is really quite good. I had some pears that needed using, so gave it a try. Like someone else said, I'm surprised there are so few reviews. Even though our Farmers' Market has long since closed for the season, our customer has phoned and requested eight loaves of this bread to give as holiday gifts to his neighbors. We are, of course, responsive to this compliment. We've made this recipe several times. One customer at our farmers' market stand buys it every time we offer it. We told him he could freeze it, and he told us it would never last long enough to reach the freezer! We make a double batch and use mini-loaf pans. The tiny little pears from our tiny little pear trees were a bit dry, so we added a splash or two of pear brandy to facilitate the purée process. 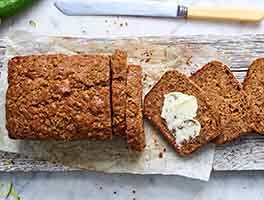 This is a really easy, delicious tea or breakfast bread (had it lasted until breakfast time). I recommend tasting the pear puree BEFORE starting to cream the buter/sugar to determine the level of "sweetness" and adjust the amount of white sugar accordingly. The pears I used were very, very sweet, so I reduced the amount of sugar to 1/2 cup and probably should have only used 1/3 cup. Between the sweetness of the pears, crystallized ginger and sugar, the sweetness can end up overpowering the subtle taste of the pears. Recommend greasing or using a floured spray on the pan as the ginger will stick to the bottom of the pan. 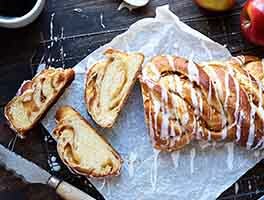 Will definitely make this again, as the loaf disappeared after one day!